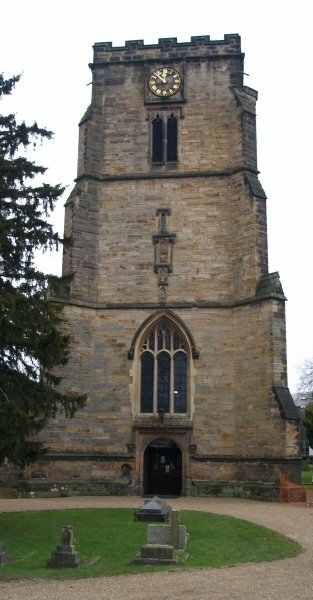 The Parish Church of St John the Baptist, Crawley. The church was founded in 1250. 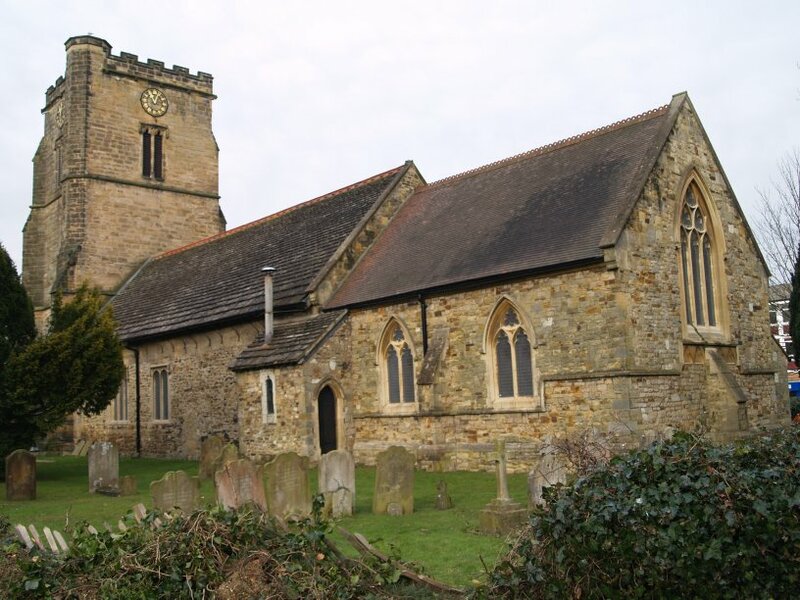 The main roof of the church (nave roof) is made of thick slates or slabs of Horsham stone. 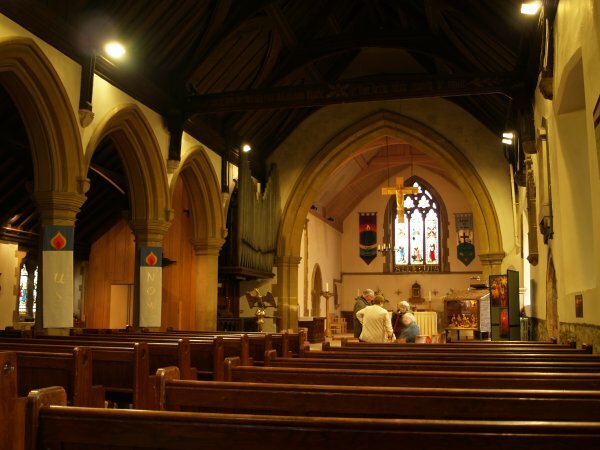 The church is a pleasure to visit after leaving the boring modern buildings of the town centre! PLEASE leave a donation in the box provided to help in the upkeep of this wonderful old building. Most of the 'solid' tower was built in the 15th century (~1466). There are three strange figures above the church entrance in the west tower. 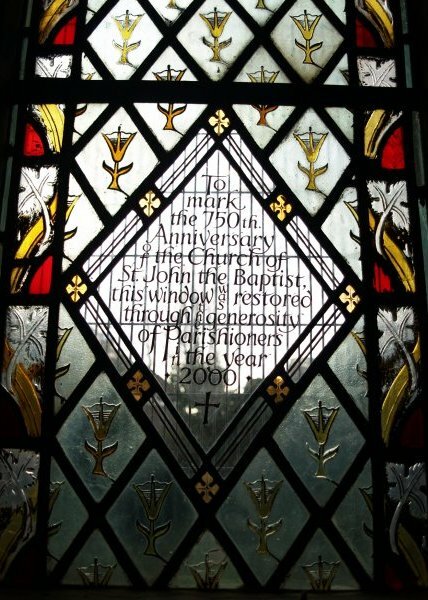 The uppermost is St John the Baptist (date? ), the churches patron saint, the middle figure is wearing Tudor dress and the lower figure of ? was added in 1880! The entrance to the church beneath the west tower. 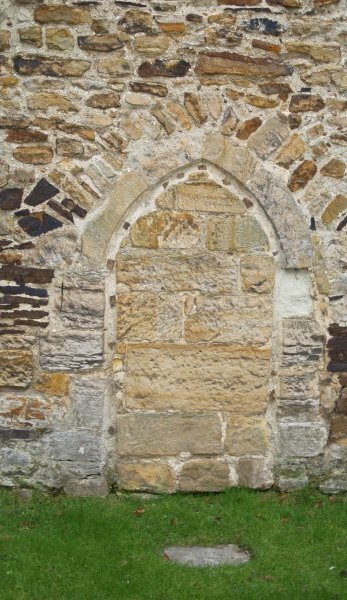 On the right is a much earlier blocked up Norman doorway in the south wall. 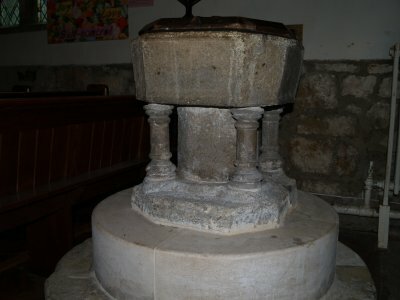 Left: The 14th century font carved from Sussex marble. 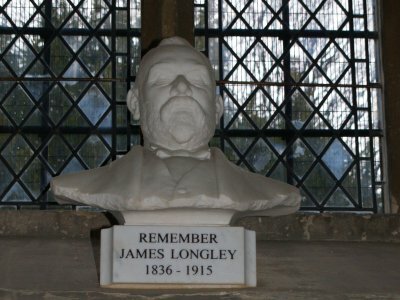 Right: In the entrance is a bust James Longley, a faithful churchman, carpenter and builder of Crawley who was responsible for many buildings in the town including Christ's Hospital school and Graylingwell Mental Hospital. Looking east down the nave to the chancel and altar, all much rebuilt in Victorian times e.g. the chancel in 1880. The organ (a 'Father Willis') was made by the famous Henry Willis & Sons Ltd. company and installed in 1885. 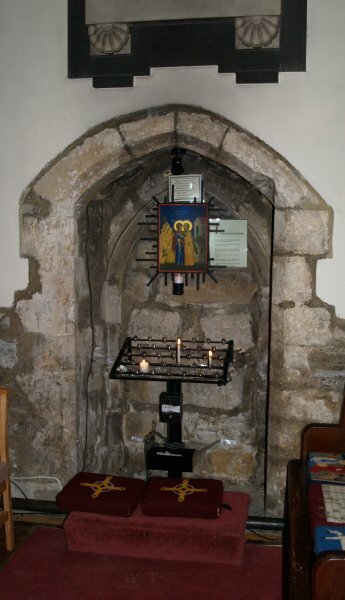 Left: In the north wall (some of the oldest stonework in the church) lies a small medieval 13th century doorway, now filled in but the inner arches house the Icon and votive candles. 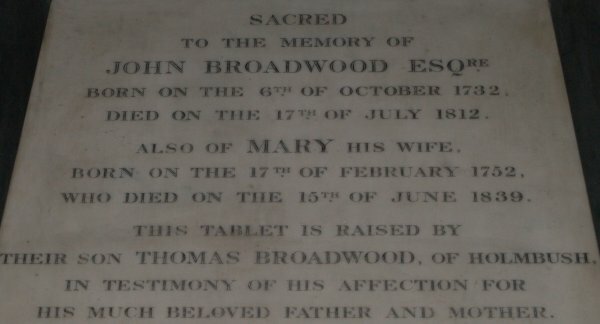 Right: The memorial tablet to John Broadwood and his wife Mary. 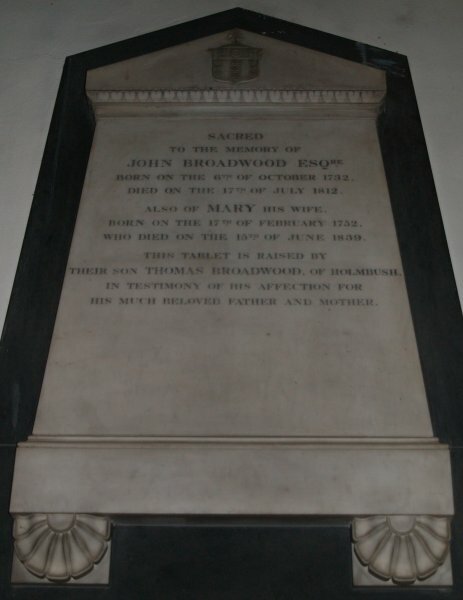 John Broadwood was founder of the famous piano making company and even Beethoven was the proud owner of a 'Broadwood pianoforte' from the 'Firm of Broadwood'. 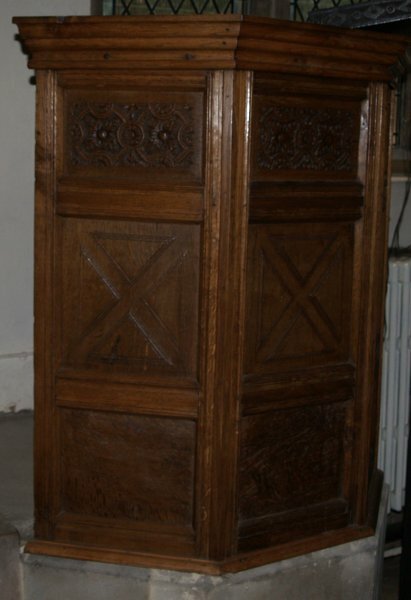 The pulpit dates from 1627 during the reign of King Charles 1st and the St Andrew's cross design below the nicely carved decorative pattern of leaves. 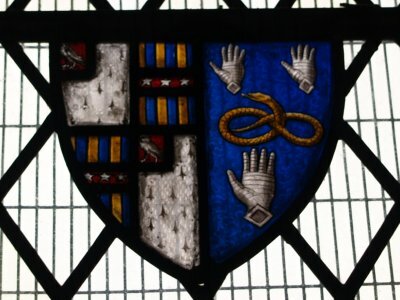 Left: Anothe old (medieval/Tudor?) 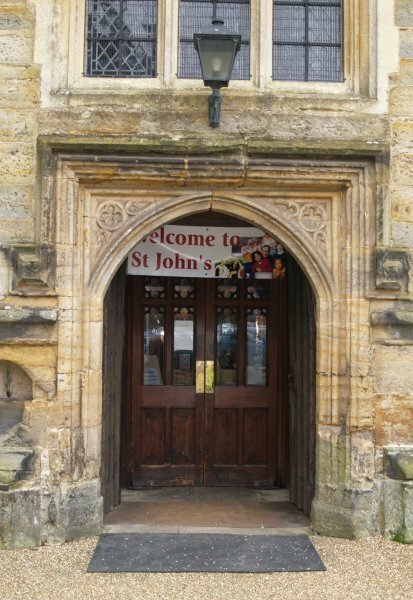 doorway near the west entrance. 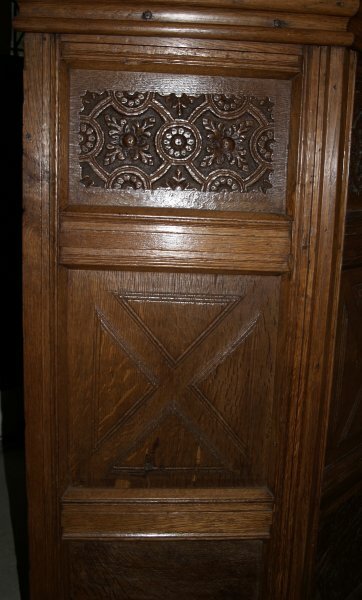 Middle: A small 15th century door behind the pulpit. Right: A small window from ~1290 now incorporated into the wall of the boiler house. 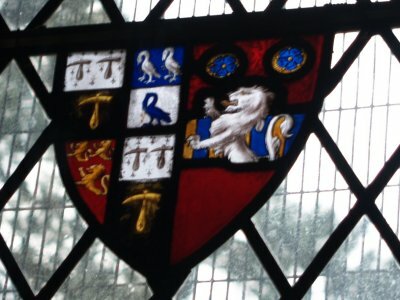 Two examples of stained glass heraldic signs. 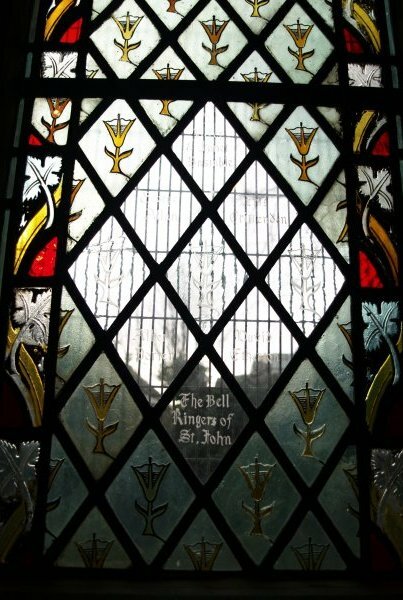 Some of the stained glass windows in the nave of St John the Baptist. 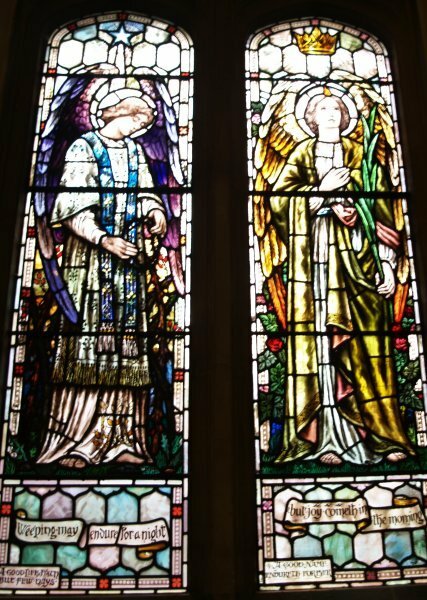 The top left is one of the most beautiful stain glass windows showing two angels, the very stylistic coloured lines of the work of the Victorian artist Burne-Jones, a friend of William Morris - and it shows! 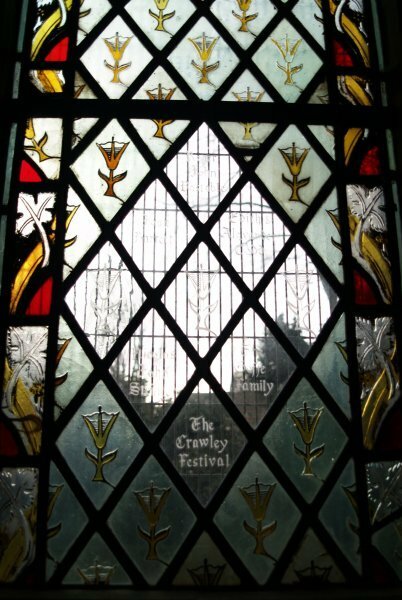 The other three stain glass panels honour the bell ringers of St John, the 750th anniversary of St John's Church and the Crawley Festival. Some the pieces of glass look very old and not Victorian ??? ?